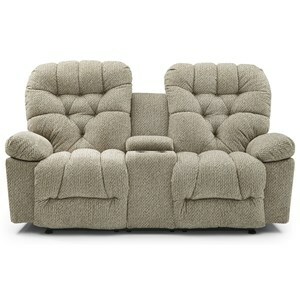 Steady and reliable, this rocker reclining loveseat's not too flashy, but its got everything that you need. Comfort and quality are the backbone of this design. It starts with a heavy-duty steel mechanism and wood frame reinforced for stability. Then its topped with plush, high loft polyester cushioning for a pillow-soft seat. 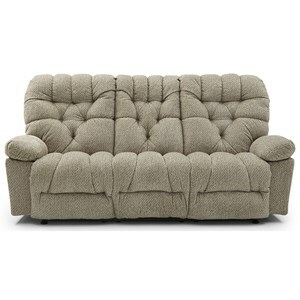 The overstuffed arms and back provide the body-pleasing comfort you've come to expect from a high quality loveseat. The Bolt Rocker Console Loveseat with Cupholders by Studio 47 at Morris Home in the Dayton, Cincinnati, Columbus, Ohio, Northern Kentucky area. Product availability may vary. Contact us for the most current availability on this product.